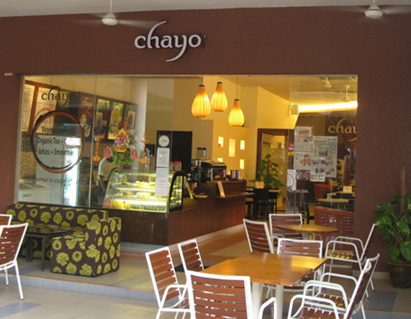 Recently, KL Yoga managed to speak with the proud owners of Chayo, a premier boutique yoga studio and cafe located in Kelana Jaya. 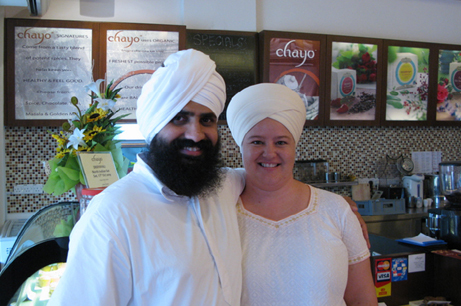 In this interview, American born Guru Jaswant Kaur Khalsa, together with her Singaporean husband, Rajveer Singh passionately share with us their journey and vision. 1) What is the story behind Chayo? One day after yoga class, a friend and I came up with the idea of starting up a yoga cafe. He suggested that I also open up a yoga studio, a concept which at that time I wasn’t too keen on. However eventually I was led into it due to the opportunities available. I believe that the cafe will always be the altar of the business, while the yoga studio is meant to serve the community. We realized that we could not put the pressure on our students to support us and therefore needed to do something else for our own comfort level as people. At that time we were coming a lot to Malaysia to teach, so it naturally developed into this. We always wanted the cafe to be a place where we could share that feeling of cosiness. The reality is that not everyone is going to try yoga, but everyone is willing to try a cup of tea. 2) Why the name ‘Chayo’? We wanted to be accessible to any culture and in a lot of cultures the world ‘Cha’ is tea. And ‘Yo’ just simply comes from ‘Yoga’ or ‘Yo’ in a form of informal greeting. We went through a lot of names and their meanings but in the end settled for ‘Chayo’ as we felt it had a strong universal connection and was easy to pronounce. 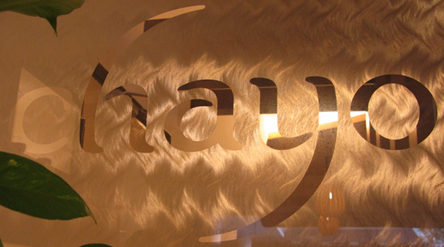 3) What are the yoga styles taught at Chayo Studio and how are they different from other centers? We started with Kundalini, which is our passion but we recognise that it’s not for everybody and our intention is not to force everyone to do it but instead to offer, and to say that this has helped us and so we want to share it. We also know that people want other kinds of balancing exercises in yoga, so we have Hatha, Ashtanga and Radiance of a Woman. We even have other kinds of activity like Taekwan-Do, Kid’s Yoga and Bhangra Dance to reach out to people who are not comfortable with meditation but would still like to have something fun and physical. 4) What is Kundalini Yoga? ‘Kundalini’ means opening or unlocking and ‘Yoga’ simply means union, to become one. Kundalini Yoga works with the unlocking of energy, consciousness and spirit. It combines different types of exercises, breathing, postures, kriya and meditation to prepare your body and mind for the awakening of the Kundalini, a dormant life force within us. Raising the Kundalini ultimately brings awareness, mental clarity and releases the unlimited potential that exists inside each of us. But it is important that this form of yoga is practised under the strict guidance of a qualified teacher. 5) You also offer Gong Meditation classes. What is that about? Gongs were anciently used in Tibet and India because the sound of the gong was known to loosen up the body’s internal tensions. It is like an internal sound massage. Dharamjot, our Gong Meditation teacher from Melbourne is a specialist in that area. In her class, she will take you through some yoga postures, and then play the gong while you submit yourself to the sound vibrations. At the end of the session, you will feel a complete sense of relaxation. 6) Can you walk us through the types of food served at the Cafe? We serve a selection of affordable vegetarian food with no egg but our biggest attraction is the snacks and drinks. The snacks are mainly north Indian influenced ranging from our Bombay Toast and Pakoras to Eggless French Toast and Tortilla Wraps. We have a whole range of herbal teas, our own five signature teas, fresh juices and smoothies. We also have Local, Indian and Western mains such as Nasi Lemak, Palak Paneer and Pasta. Whenever possible, we try to incorporate organic or local ingredients in the food we prepare. 7) Tell me more about the specialty teas you carry. Yogi Tea is from the United States and was inspired by the knowledge and wisdom of my master, Yogi Bhajan. In the beginning, some of Yogi Bhajan’s students started using the home recipe that he gave for the tea after the yoga classes. This was the original Yogi Tea, which we also brew and serve here. Eventually, they started to expand the offerings by creating other blends of tea as people wanted to buy it. Yogi Tea has an exotic aroma and strong flavour of blended herbs and spices to heal the mind, body and soul. Among the ones we sell are Himalayan Apple Spice, Woman’s MoonCycle and Throat Comfort. Hari Tea is from the Netherlands and for added variety, we have picked a more subtle and herbal range for our cafe. Some of the unique and amazing blends we have are Linden & Chamomile, Rose & Hibiscus and Green Tea, Mint & Chilli. Chayo is certainly everyone’s cup of tea. Whether you crave to experience the exhilarating energy of a bhangra dance, enjoy the relaxing benefits of a yoga class or simply want to drop by for a satisfying yet healthy treat. 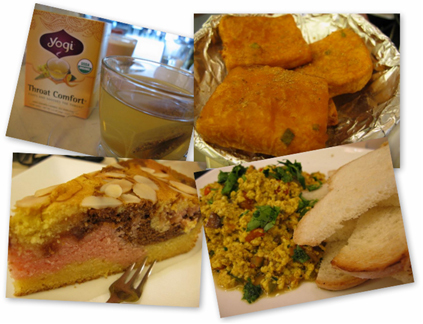 KL Yoga readers are entitled to a free appetizer of their choice when they order a daily set meal. All you have to do is to mention ‘KL Yoga’. Offer valid till 31 Dec 2009.
went over to chayo for cha today at approx 1700hrs. Family day out, parents, my kids, brother kids etc, about 7 adults and 4 kids. Ordered masala tea for a start, got really CRAPPY tea, dont know what to call it really. there wasn’t a hint of masala in it and i have tasted better tea at a cheap stall. There was no effort at all from the chai maker.total waste of money. anyway, we spent 80 ringgit, and thats it. NEVER going there again. Its not about money, but get it right guys. Waheguru. Hi, i want to know if they sell the yogi tea individually. i mean in boxes, if yes how much does it cost?